Without further ado, let's get started with all aspects of creating your own Disneyland! 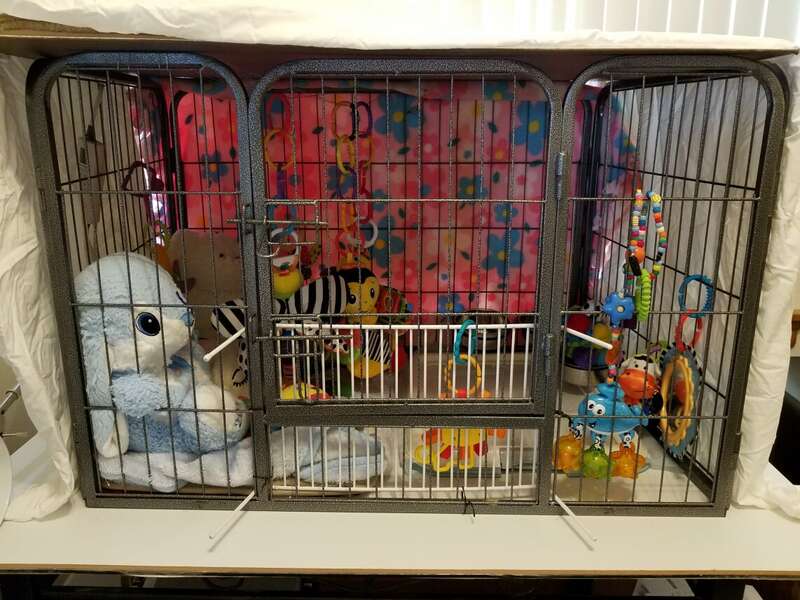 What Will You Set The Cage On? Once you have it all together, where in your house will you put it? 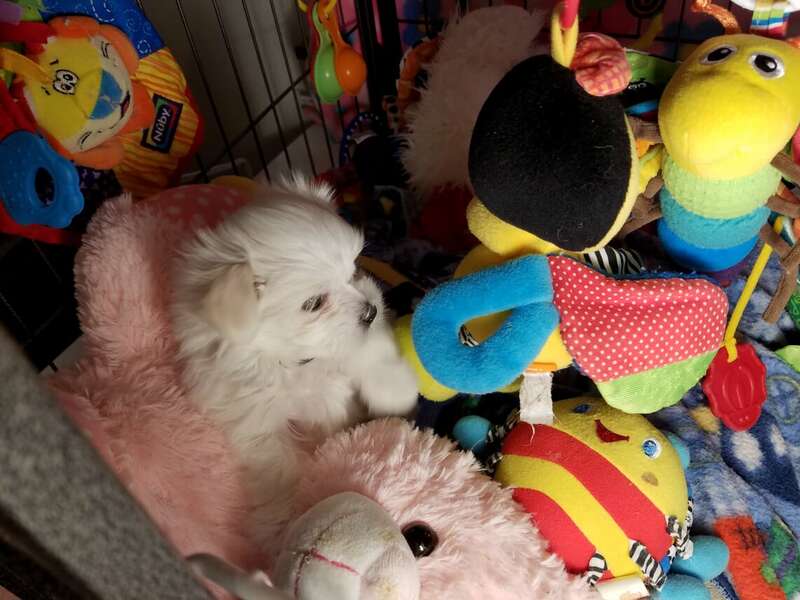 I suggest putting it in a central location where you can see your puppy the most. You want to be able to observe him or her while you go about your daily activities easily. You want to be able to play and hold the puppy near their home. Be sure to think this out. I suggest that you put your baby at the center of your universe. It will make a BIG difference once you take puppy home. Do not put it in your bedroom unless you want to be kept awake at night and seclude your puppy during the day! 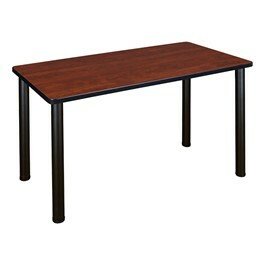 This is 24" Deep by 36" Wide. There are two doors, one on the left side and one in the center of the front. We will use the center door. You can find everything on this page at this link on the blog. 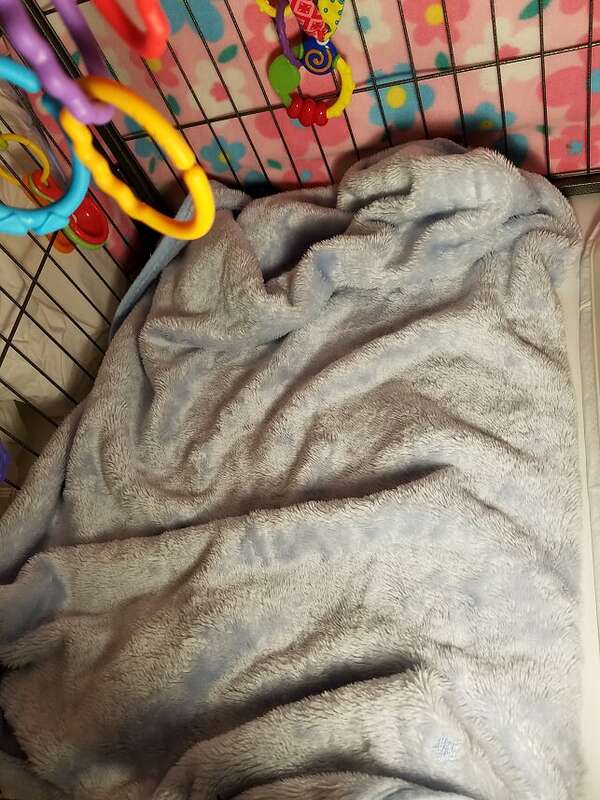 If it helps your puppy, you can put a blanket or sheet over the front at night to help him sleep or when company comes over to shield puppy or when napping during the day if needed. When you open the door, your puppy will be there to greet you. 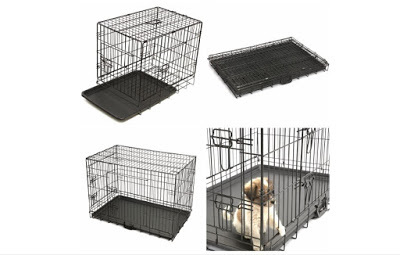 You will need to find and secure a grate of some sort to put across the opening to keep puppy from falling out. 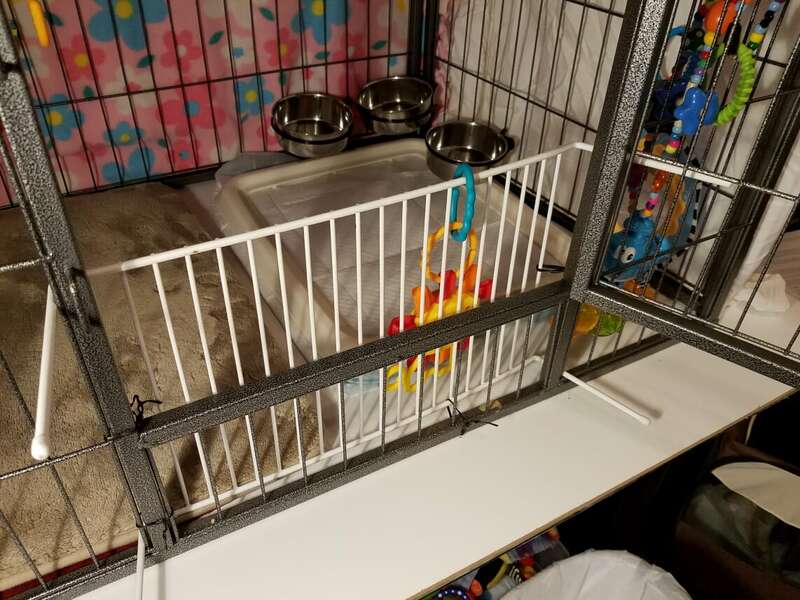 I used a wire shelf with the legs poking outward secured with twist ties. It works! Some have used longer racks for cookies or wire shelves like I did. Think out of the box. Hint: don't use cardboard. He or she will chew it up in a hurry! 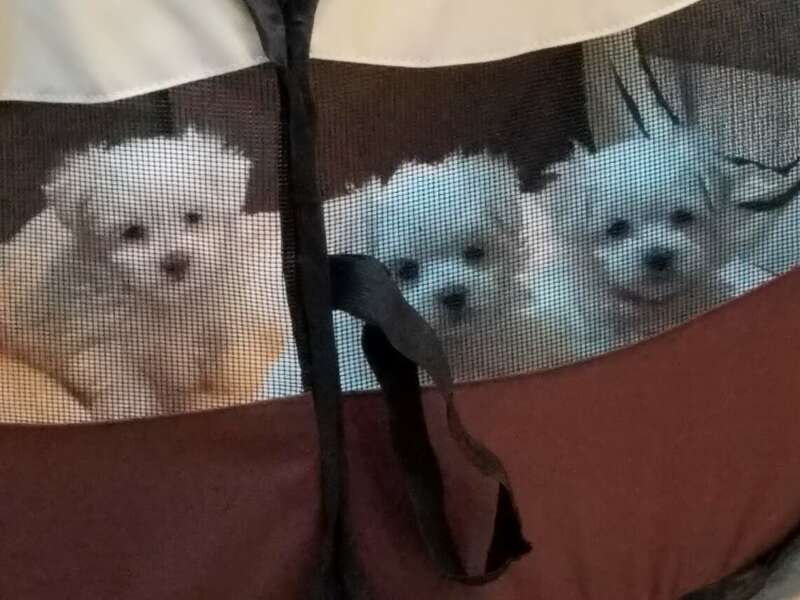 Use something that you can see through so that you can observe your puppy. I put the heating pad on the left side of the pen (personal choice). This is a special heating pad for several reasons. It can be set to turn off after 2 hours or to stay on till you turned it off. You want it to stay on. Very few now a days have that option. See the link above on my blog for where I purchased it. 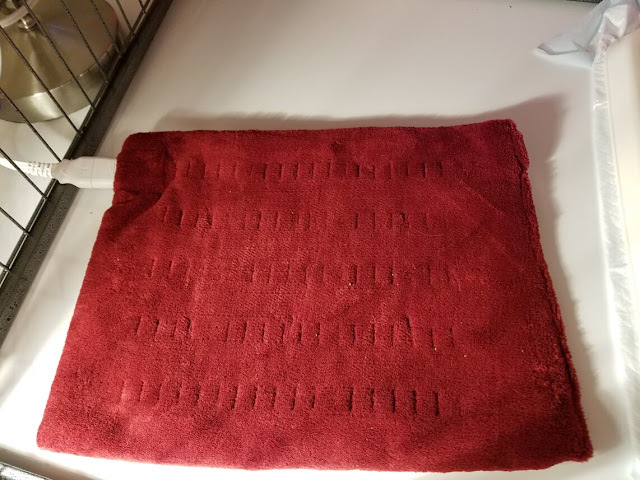 The soft velour cover does not come off for cleaning so you may want to cover it with a pillow case. 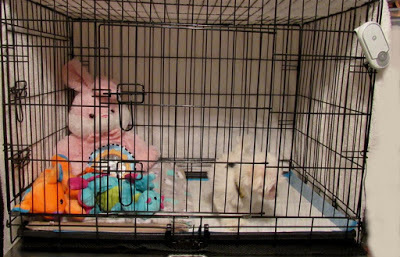 Put it toward the front of the cage on the left and work the plug through the wires to plug it in. 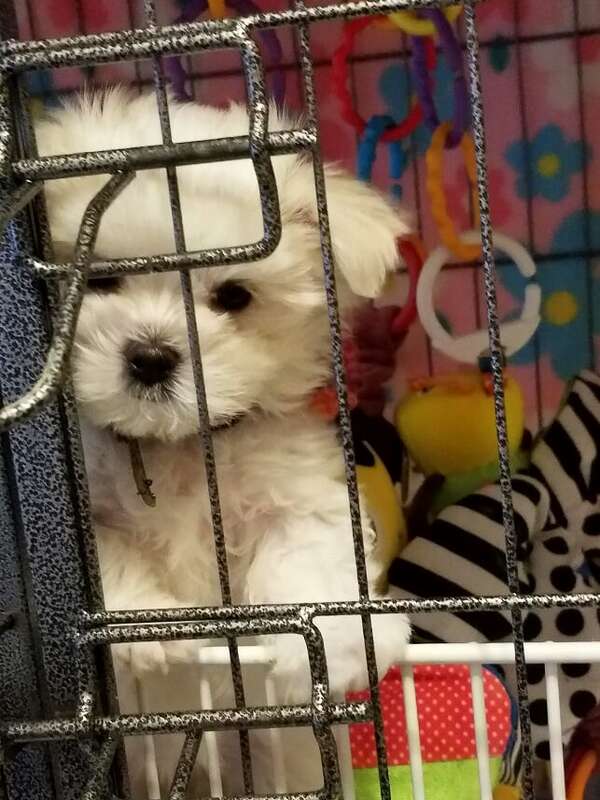 You don't want your puppy to gain access to it as he may chew on it! Mine have never done so. You will be putting more stuff on top of this. Depending on the weather and your puppy a suggested temperature could be #3 (be sure check with your vet). You don't want it too hot or cold. 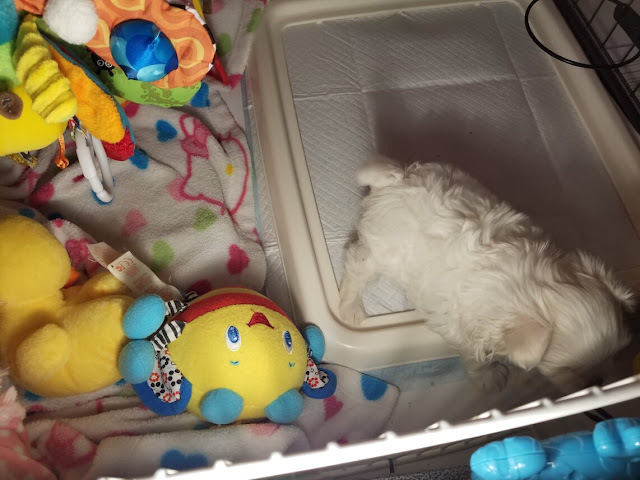 The puppy needs to be able to move away from the heat source (heating pad) to cool off if desired so be sure to keep it towards the front. They can move to the back or right side if they want or need to. Your puppy will be very small when you bring him home and will need heat. Even when grown, most Maltese crave heat. Adjust yours according to your vet's recommendation and your puppy's needs. This memory foam pad comes in the exact size to fit perfectly. To purchase them, please see the link at the top of the page for where I list what I use and where I buy them. This is actually a bath mat. It's soft on top with a ruberized bottom. Perfect for our use. They come in many colors. I prefer tan. I wash and BLEACH everything daily or as needed. This retains its color even through bleach! It's also very comfy for baby. Put this on top of the heating pad. NEVER have the heating pad next to puppy! Next, put a soft, fleece blanket over the pad to keep it clean and create the softest and warmest place for your puppy to play and sleep. They will spend a lot of time here. I change mine daily to ensure cleanliness. 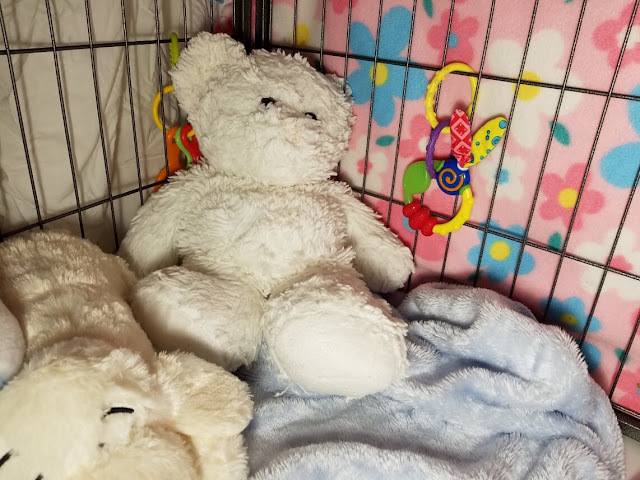 I get all of my blankets and toys at thrift shops. Besides saving money, I just love buying stuff for my babies. Each "find" is a treasure! Bring them home, bleach them and they are as good as new! You will need several due to changing them often. This is specifically designed to hold pee pee pads in place. You set the pad on the base and add the "frame" to lock it in place. It's easy to use and keep clean, just wipe it off as needed. This and the pee pee pads can be purchased at the link above. 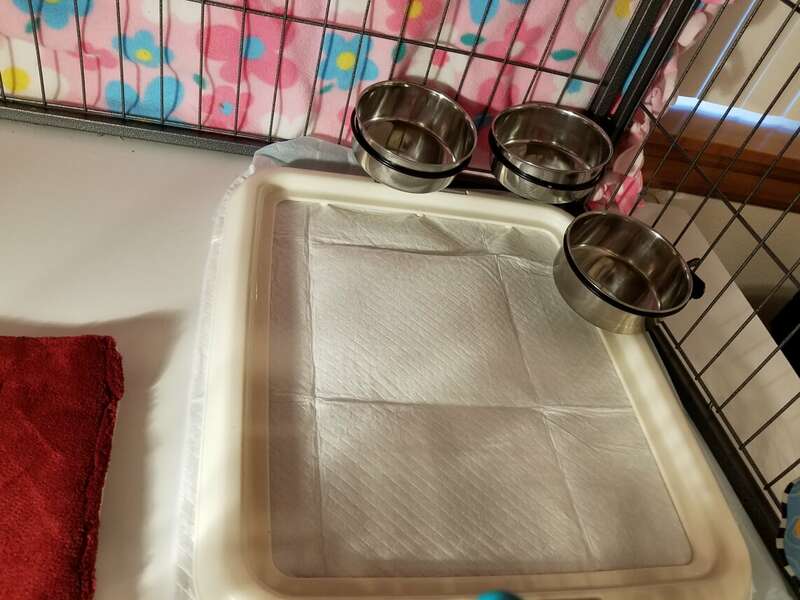 If your puppy starts tearing and chewing on the pee pee pads (some do) replace it with a receiving blanket (be sure to have some on hand for this reason). Don't scold puppy, keep this a happy "yes"environment always (meaning they can do what they want in their place) . These are awesome because they attach to the side of the cage so they can't be turned over. Be sure to place them to the back like I have them here because puppy plays mostly at the front and you don't want them playing or stepping in their food or water. 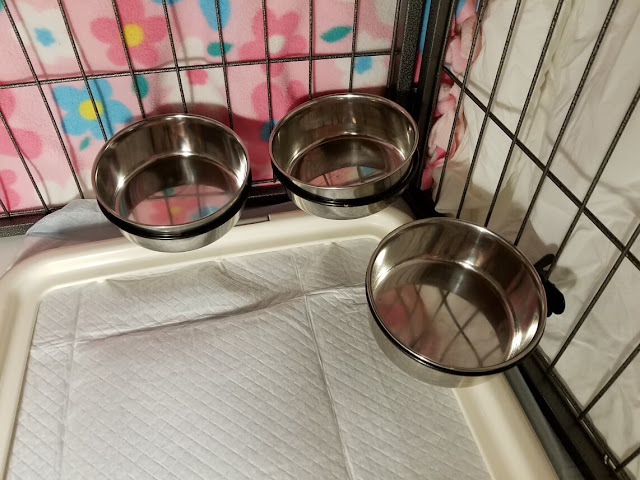 Three are needed because your puppy will need acess to a wet and dryer food plus water. Your puppy's food requirements will be told to you at pick-up. You will need 3 dishes. 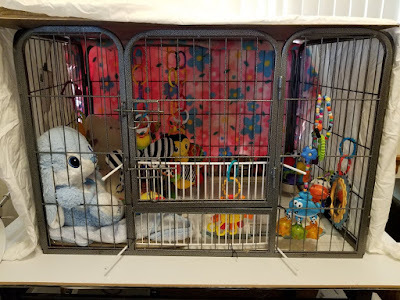 Before I wrapped my cage with either a sheet or blanket I put a bright, colorful, happy blanket across the back wall on the outside. It makes it fun to look at and it matches all the colors of the toys. It just seems "dull" without it. Some call it Disneydud without the colorful back wall. 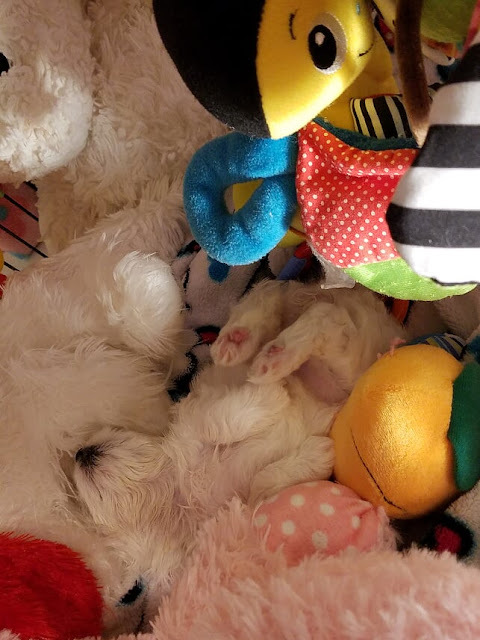 Your puppy will love sleeping on and snuggling with his or her stuffed animals! Be sure to get fluffy ones that they can sink into. Be sure the outside "fur" is fluffy too. 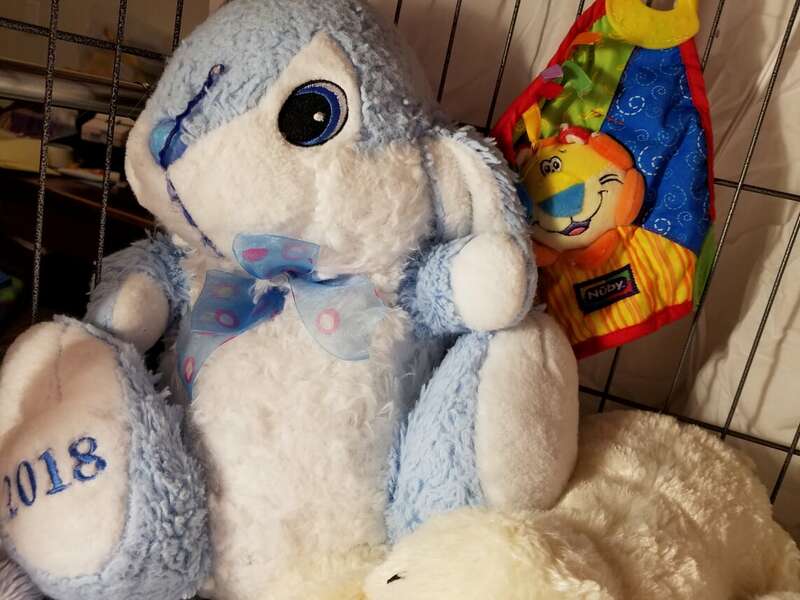 Plush animals that aren't fluffy on the outside are not good. 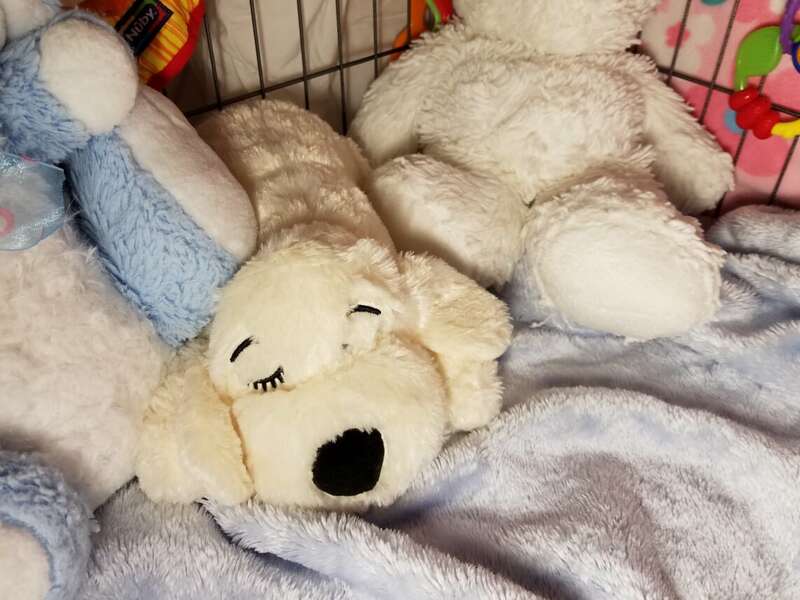 Also, be sure to have at least one big WHITE stuffed animal because it reminds them of Mom (who was white). I notice that they tend to sleep on the white ones the most. 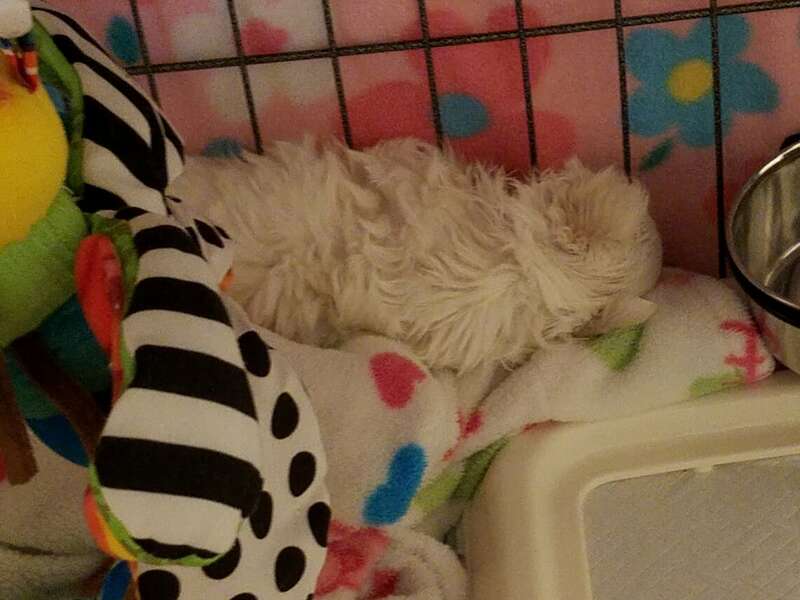 They also love having a small white one too that reminds them of their litter mates. 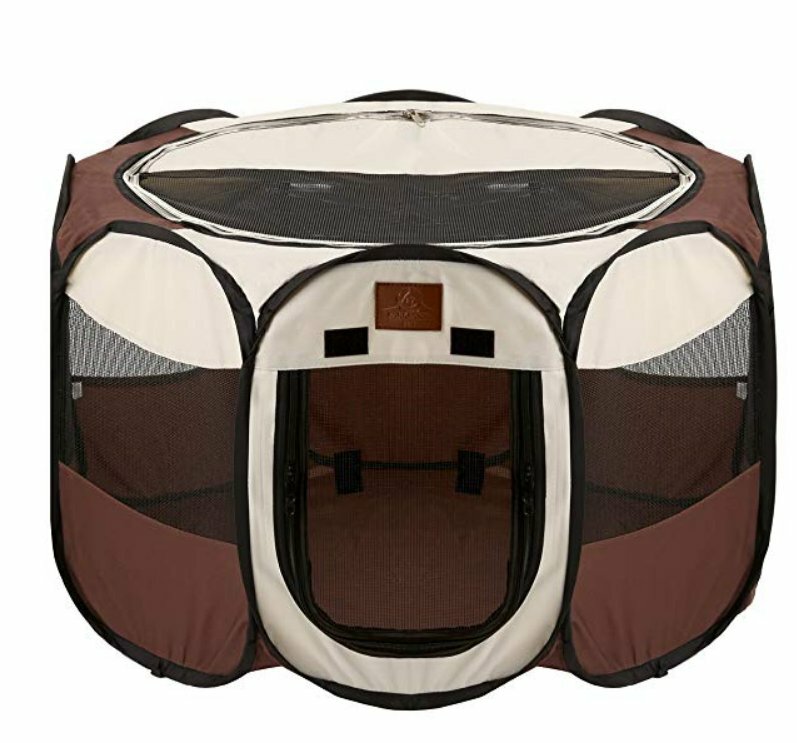 There is a sleeping dog in there that has a "heart" inside a velcro pouch with a battery operated beating heart. They love "her" and think it's Mom since I have one that they are used to. See the link above in order to get one if you'd like. I will send home a soft blanket with Mom's scent and that of her litter mates and me to put in their new bed. This makes their transition seamless. They feel right at home when they get to your home immediately! Get some smaller toys that they can chew on and carry around. They also love things that make noise when they do something to it. The yellow and red toy makes noise when stepped on. There are crinkle toys and ones with a bell in them. 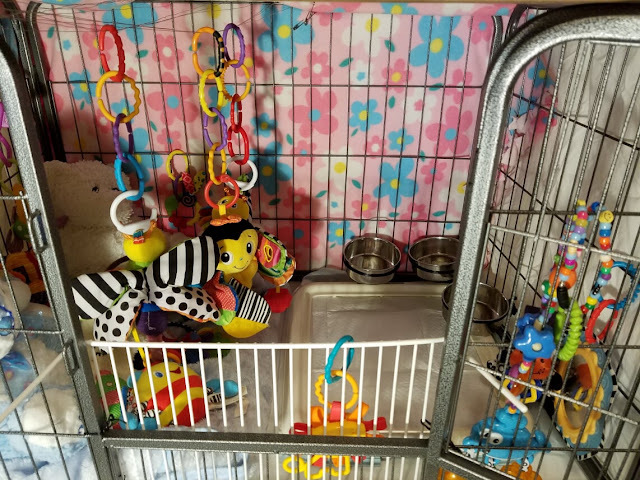 I used a lot of cat toys cuz they are small and have noise to them. Be sure that you can wash them & nothing will or can harm puppy. Remember, your puppy will be teething so get a teething ring, some chew toys and or something for him to chew on. They love pig ears because they are thin and easy to move around. I put three hanging toys in my Disneyland. 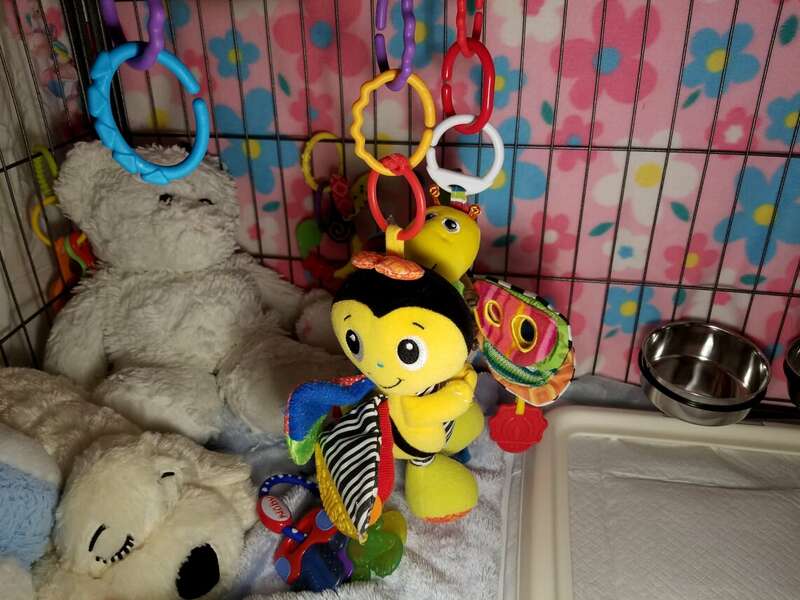 They are attached to the top of the cage by rings and each toy hangs down from rings. 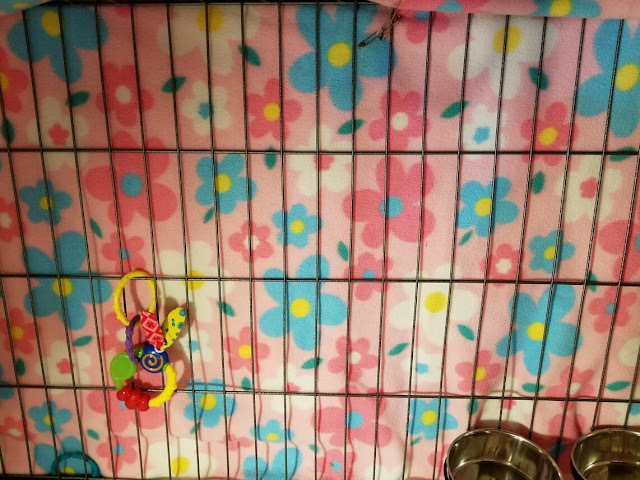 I hang them down the center of the cage right next to the end of the memory pad and before the pee pee pad holder. This gives them room to play on either side. 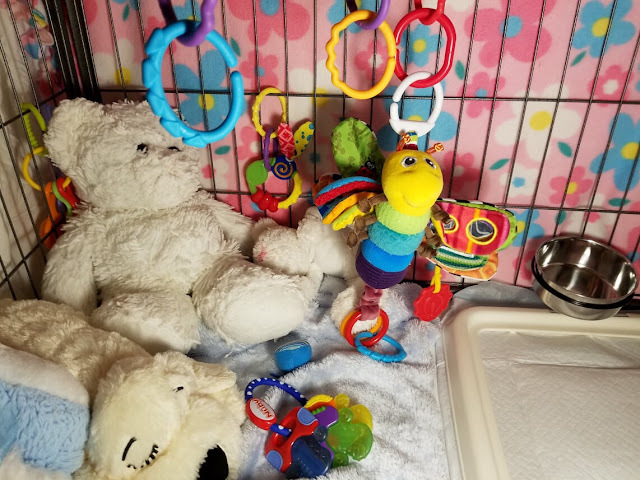 My toys are large so I use 4 rings for each so that they actually touch the bottom of the cage. You will probably need 15 or more rings. I buy hanging toys (see where I buy things to get yours) that have noise and crinkle sounds. They love them! Be sure to buy ones that are colorful. Some people try to accessorize their Disneyland to match their home decor. Please don't do that! This is your baby's home. It should be colorful and fun, fit for a baby. Relax and have fun with your little one. This is a center of joy! 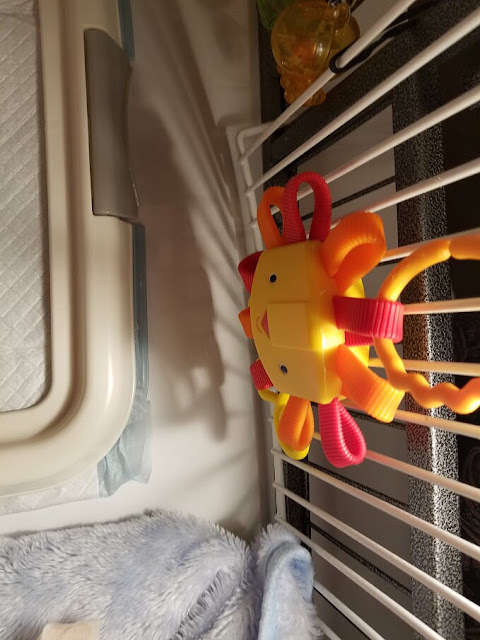 I also hang toys on the sides and front of the inside with things they can chew on or make noise with. Again, they love it! 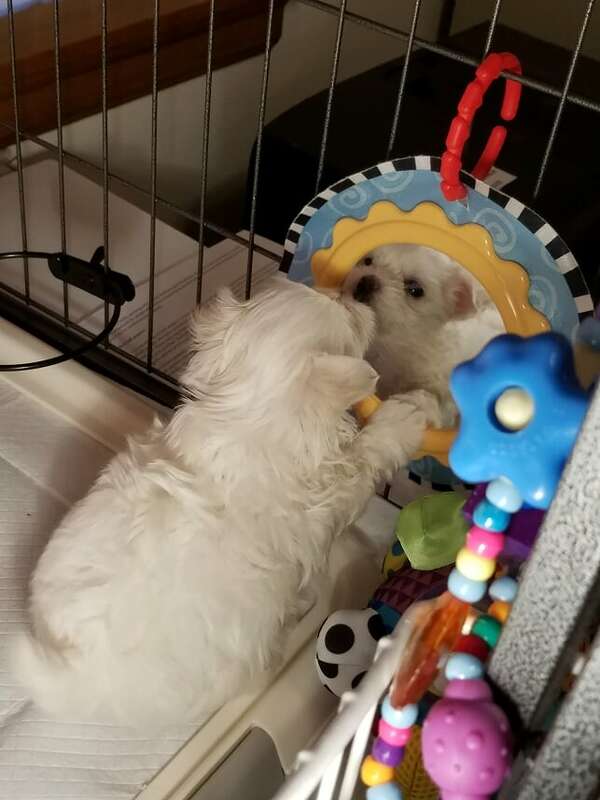 Most puppies love mirrors. They think it's a playmate they are seeing. My puppies love them as you can see. You may have to pin it on one side to keep your puppy from flipping it over as I needed to do. 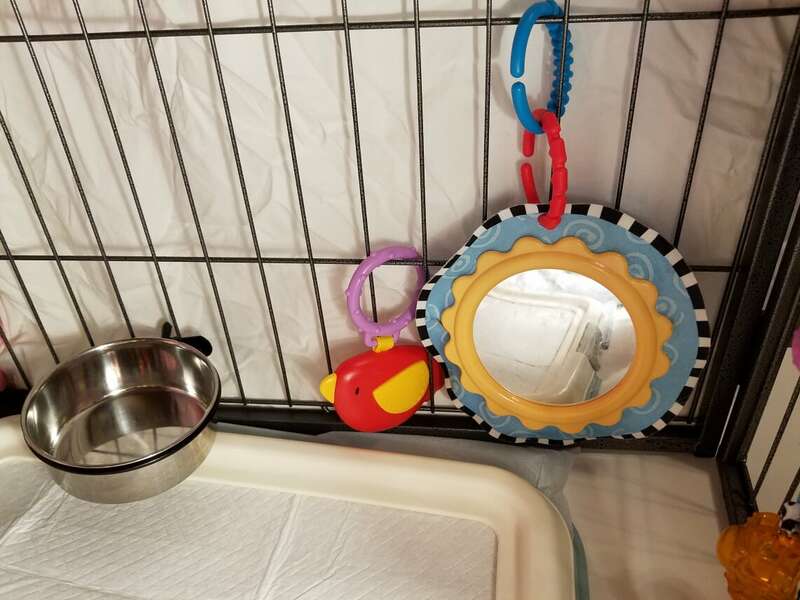 You will need a safe place to put the puppy in when cleaning their pen. This handy little folding pen with a bottom is perfect. 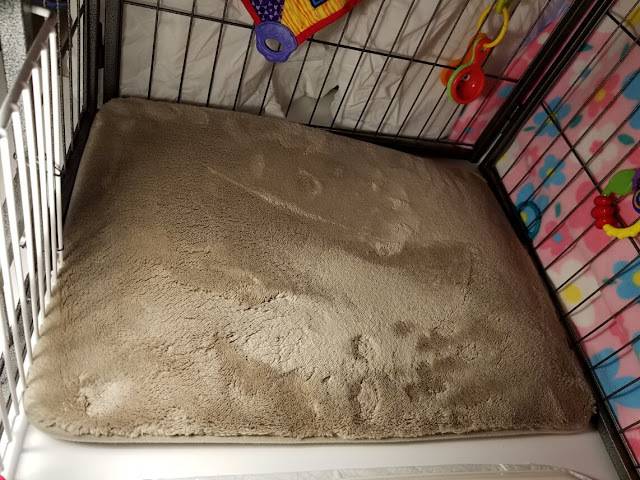 Put a pee pee pad in the bottom and put baby in it for stress free cleaning. 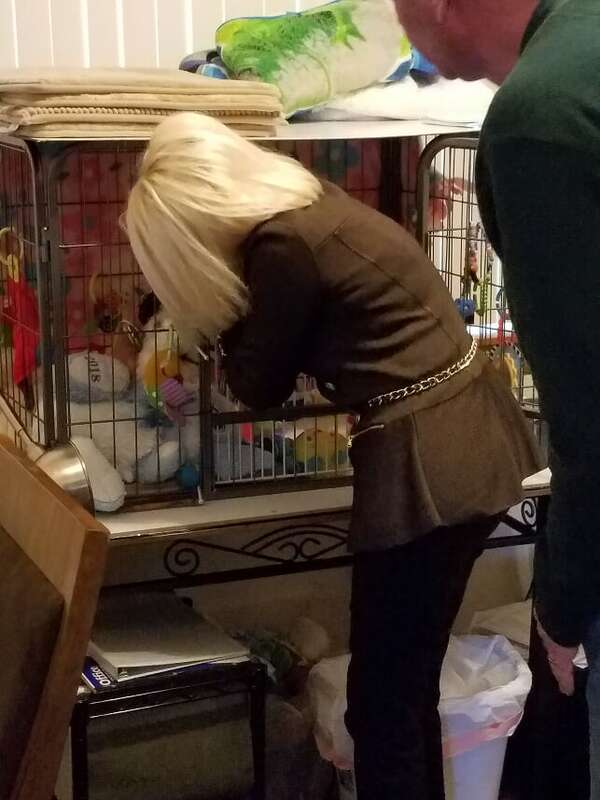 One last thing is the smell of your washed toys and blankets. I use Snuggle, Blue Sparkle scent. Smell matters because that's the sense that they use the most at this age. 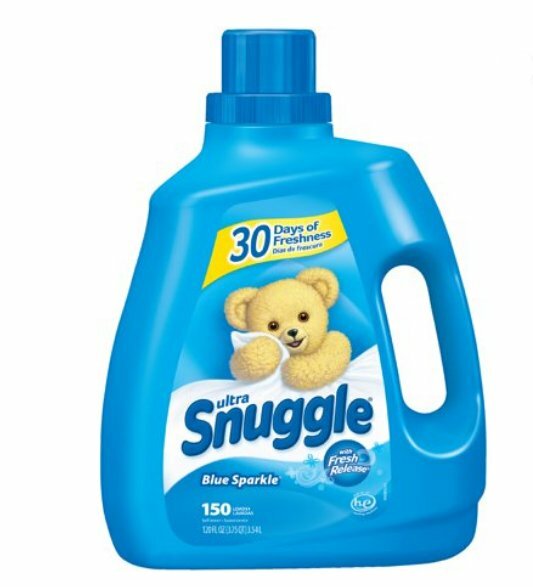 So, if you want your baby to smell the same scent that he or she is used to, get Snuggle, Blue Sparkle scent :) It smells so fresh and awesome!! That's how you can create your own Disneyland for your baby. 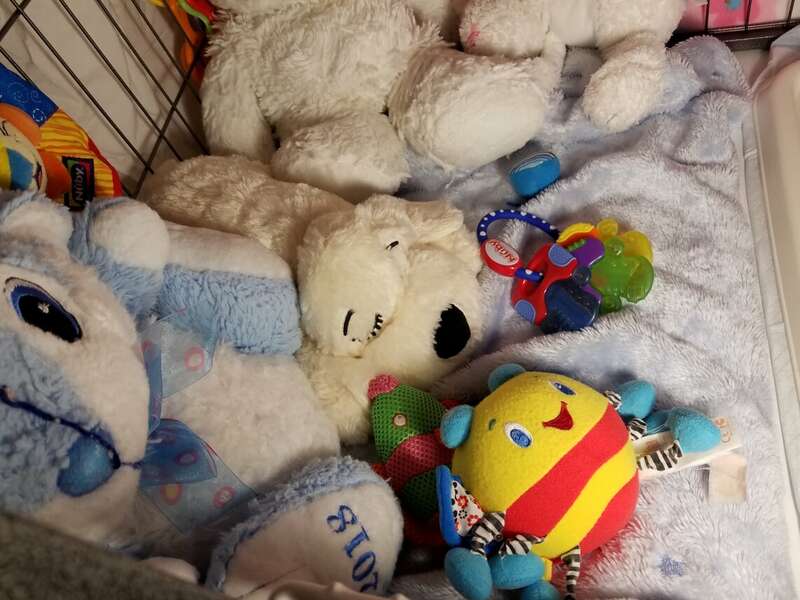 The question is, will you have one for your baby when he or she leaves mine to go home? GO TO WHY DO I NEED DISNEYLAND? Please take a moment to post a comment below. Thanks!